Several years ago the New York Times published an article about creating your digital legacy, a piece that echoed many of the thoughts that preservation specialists have been expressing since the advent of the internet: what happens to our digital photos, online accounts, and other items stored on remote hard-drives and in the cloud when we are no longer able to maintain them? What are some of the best strategies for organizing these collections and accounts? Who has access to our usernames and passwords after we die? What happens after the androids rise up and enslave us all? Fortunately, archivists, librarians and preservation organizations have taken these questions very seriously. In 2005, Preservation Week was established by the American Library Association in an effort to educate the general public on practical strategies for taking care of their priceless artifacts and digital collections. In 2014 the Daniel Boone Regional Library began offering a Personal Archiving course that teaches some of the basics behind digital preservation. In the five years this course has been offered we have also assisted patrons with digitization; scanning hundreds of family photos, slides and documents in our Studio digital lab. The library also offers many complimentary classes such as Windows 10, Basic File Management, iCloud and Google Photos to assist patrons with other aspects of file and cloud storage. 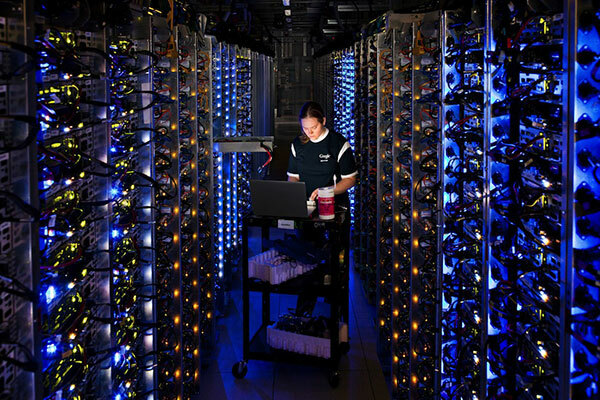 Google data center in The Dalles, Oregon. Image from The Dalles data center photo gallery. In addition to the classes found in our extensive tech offerings, the library also carries several important books about digital preservation in its collection. The book “Personal Archiving: Preserving our Digital Heritage” is a worthwhile guide, with contributions from leaders in the field. In Chapter 5 of the book, Evan Carroll writes: “social media websites and cloud-based services have caused personal digital content to spread beyond the tangible media in the possession of the individual. Today, people commonly store digital content on numerous computer systems that they themselves do not own and that are not physically located with the remainder of their estate.” A common question we get in our tech classes is where photos and data on Google cloud services like Google Photos or Google Drive are stored. More than likely this data is found on servers scattered throughout the globe, the largest in the Columbia River gorge near The Dalles, Oregon and in Jurong West, Singapore. These are massive and impersonal data centers dealing with unfathomable amounts of terrabytes of information per second. Although relatively secure and backed up in multiple locations, one certainly does not have ready access to, nor complete control over, this data. “How to Archive Family Photos” by Denise May-Levenick, discusses strategies on how to preserve and digitize your hardcopy photos and turn them into manageable collections. What has become somewhat of a mantra for those in the preservation world is the following: photographs can be enjoyed by far more people when they can be viewed on a device, zoomed in on, shared and otherwise downloaded in a digital format. However, even digital copies require upkeep and care. Levenick’s strategy involves a several step process of identifying and curating the photographs you would most like to preserve, digitizing these photographs and then assembling the data in some orderly fashion that will make sense to the end-user, i.e. you and those who may take over your digital legacy. The library also offers One-on-One Tech help sessions where attendees can scan their photographs or documents using our ScanSnap document scanner and Canon photo scanner. Sessions are 45 minutes per attendee and we will assist with the scanning process. As part of our mission to connect library users with the tools to stay abreast of the digital world we also offer classes through Lynda.com, one of our world class instructional databases. Just a sample of some of the digital preservation courses offered through Lynda.com: “Organizing and Archiving Digital Photos,” “Photo Archiving, Preserving family memories” and “The Importance of Preserving Memories.” All one needs is a library card and internet access to get to Lynda.com through the library. Personal Archiving will be offered twice in the upcoming months: our next class is on Wednesday April 17th from 2 – 3:30pm. Space is limited for this class so register as soon as possible. You can register by calling (573) 443-3161. The class will also be offered on May 15th from 6 – 7:30pm, with registration beginning on May 1st.